Ringgold High Sophomore, Gabi Clarke represented RHS and the State of Georgia at the Congress of Future Medical Leaders in Boston over the summer. 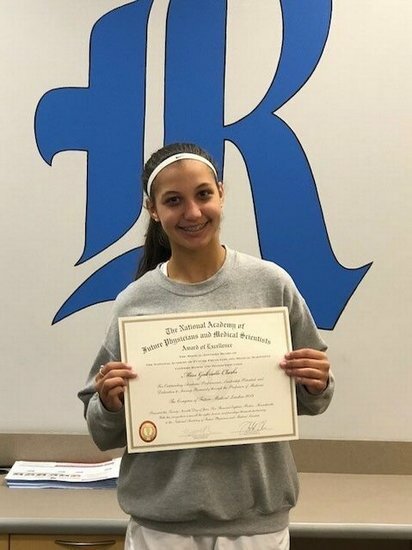 According to a letter of commendation from the National Leadership Academy, Gabi had the chance to study under "some of the greatest living minds in medicine" who have won some of the world's most prestigious international prizes. During the conference, Gabi was able to watch live surgery, make new friends who share her passion for medicine, and interact with medical school academic leaders. This conference was a true honor for Gabi and a great learning experience. She says that she wanted to attend this particular conference for many reasons, but mainly because she knew she would get to meet other students who want to be in medicine, too. "I met someone from every state. Since I want to be an orthopedic surgeon, I wanted to get all the advice I can get from the guest speakers." You can watch a 3-minute highlight film at www.FutureDocs.com for more information on this incredible experience.